The burger: What may be the ultimate in butter burgers can be found at Herbie’s on the Park in downtown St. Paul. 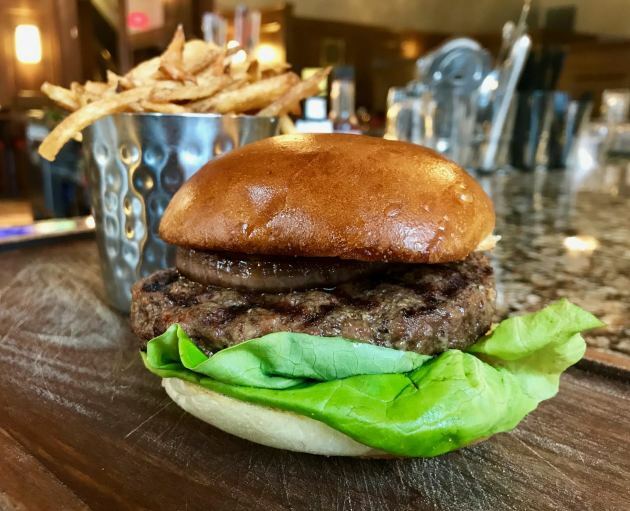 It's called the Tavern Burger, a somewhat deceptive name since no neighborly mom-and-pop joint would maintain the attention to detail that’s lavished on this specimen. St. Paul native Joe Ruhland is running the kitchen at the 2-year-old restaurant, which is located inside the stately Rice Park structure (complete with one of the metro area’s great dining-room fireplaces) that was originally home to the Minnesota Club. The restaurant is owned by Minnesota Wild owner Craig Leipold. Ruhland stepped into his role about six weeks ago, after nearly a decade of cooking in St. Cloud and a stint at Target Center in Minneapolis. At Herbie’s, he’s making tweaks to the all-American format set by his predecessor, Tim Kovacs. Here’s hoping Ruhland doesn’t touch the kitchen’s Tavern Burger. It’s a doozy. The 7-ounce patty is thick and substantial, and reaches from bun edge to bun edge. The Minnesota-raised beef follows the classic 80/20 meat/fat ratio, and it gets basic seasonings: kosher salt and freshly ground black pepper, both designed to enhance the beef’s built-in flavor. When asked how I wanted it cooked, I gave my standard reply: “The way the kitchen prefers to cook it.” What arrived was a spot-on medium-rare, with the charbroil grill’s heat nicely caramelizing the exterior with criss-cross hash marks while maintaining a juicy, tender, more-than-pink interior. Garnishes are kept to a minimum. A colorful layer of tender Bibb lettuce leaves, slipped under the patty, prevents those beefy juices from soaking into the lightly toasted bun (a gleaming, egg-enriched bun, from Rise Baking Co.'s New French Bakery). There’s a hearty tomato jam, boosted with applewood-smoked bacon, honey and a just-right bite of apple cider vinegar. (Which leads to my one wish: All that rich beef and butter would benefit from the crunch -- and palate-cleansing vigor – of a few pickles). The onion component is, well, fascinating, and ingenious. It’s a thick slice of a yellow Spanish onion that’s nurtured in a low-temperature oven for several hours, aided by clarified butter, a bit of brown sugar and salt. It’s a process that thoroughly unlocks the onion’s sugars and preserves its disc-like shape, but transforms the texture into plush softness. Great taste aside, it has an unexpected, almost sculptural elegance. No cheese, and it's not missed. That's because the burger’s secret weapon is butter, a hefty pat that’s not just any old slice of Land O’ Lakes, but an umami bomb of a compound butter composed of veal marrow, miso paste, garlic and shallots. Fries: Included, a basket of thin-cut, golden brown, can’t-stop-nibbling fries. Address book: 317 Washington St., St. Paul, 651-726-1700. Open 11 a.m. to 10 p.m. Tuesday through Thursday, 11 a.m. to midnight Friday and Saturday, 10 a.m. to 9 p.m. Sunday.